Hannah Martin, born in 1988 and from the United States. 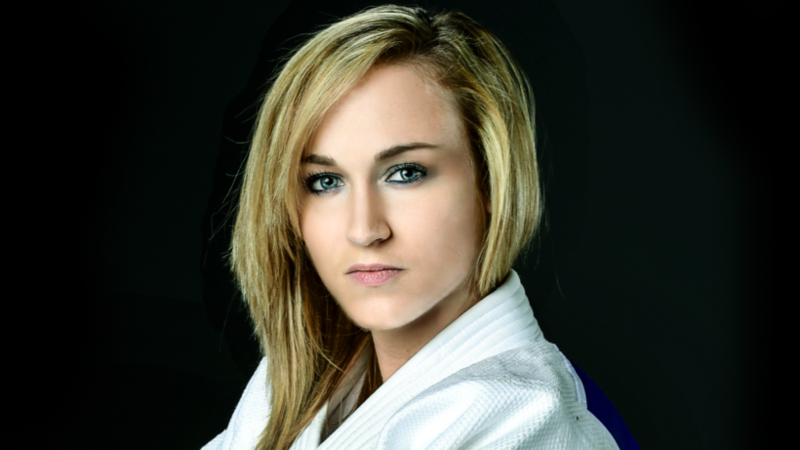 A successful judoka in competition who fight in the biggest tournaments in both Europe and in the States. Her goal is clear, to once become Olympic Champion. But her journey has been tough even since the first step on the mat.She guests with joy on the blog to share her story! My judo journey began by accident. I like to tell everybody this because I literally had to beg my father to try judo. I was 8 years old when I was brought to my first judo class to “watch” my younger brother try it out. “Judo is only for boys”, my dad kept telling me and with lots of hesitation and my constant whining my dad FINALLY let me get to put a gi on. Once I stepped foot on the tatami, it felt like I had conquered the world. Judo was a constant battle with my family, once I started competing and traveling out of the state to go to Nationals and other competitions my parents did not want to fund and support my judo. There was no way I was going to quit judo, so once I was old enough I got my first job at 14 years old to help pay for tournaments. There were so many moments where I felt defeated and I thought that there was no way I could afford this sport. But I fell in love with the sport of judo and nothing was going to stop me from reaching my goal, and that goal is to be Olympic Champion. My name is Hannah Martin, I was born and raised in upstate New York. Upstate New York is what I like to call the “country” part of New York. I literally live next to horses and an apple farm. I am 2008 Olympic Alternate at -57kg, 2x US Open Champion (57kg, 63kg), 2x National Champion and I have multiple international medals on the IJF world tour. My ultimate goal is to make the next Olympic Team in Rio and I am doing whatever I can to earn my spot on the USA Olympic team. I really started taking my judo career seriously after moving up from 57kg to 63kg, at the end of 2011. I was struggling to make 57kg and judo wasn’t about the sport, it was about running and making weight. I was unhappy and miserable, and I knew if I didn’t make a change I would either quit or fail at 57kg. After moving up to 63kg I had limited success going 0-1 at almost every international event that I attended. I quickly realized that any hopes for making the 2012 Olympic team were far out of reach, I was ranked #110 in the world and there was no way I was going to make the cut. So it was time to stop worrying about competing and focus on training and improving my judo. I earned my first international bronze medal at 63kg in May 2012 at the Miami World Cup, from there I moved on to win my first World Cup title in El Salvador and claim the #1 spot on the USA Ranking roster, since May 2012 I still maintain my #1 spot. By the end of 2012, I went from being ranked #110 to #28. 2013 was also a successful year for me, I earned my first Grand Prix medal in Mongolia in July. I took a bronze medal at our Continental Championships (Pan American Championships) and made my first World Championship team. I was also selected to compete in the World Masters competition in Tyumen, Russia- this is a competition where they invite the top 16 competitors in each weight division! By the end of 2013 I was ranked #9 in the world. This year has been a little tougher, the Olympic Qualification period started in May of 2014 which means now everyone is out on the IJF world circuit trying to collect as much points as possible to qualify for the Olympic Games. In March, at the Samsun Grand Prix I injured my knee in the bronze medal match. The knee injury was pretty serious, I was unable to train and practice for almost a month and a half and the doctors told me that I partially tore some ligaments in my knee. I was stubborn and decided to not take the time to rest, and I tried to compete at the Pan American Championships and I was very unsuccessful. It was like I was fighting on one leg, and I ended up going 0-2, losing to two girls that I have never lost to before. After the Pan Am’s I decided that I needed to take the time to heal and rehabilitate and I came back ready to compete just in time at the Cuba Grand Prix!! Time is just flying by, and I’ve had such a crazy tournament schedule this year. This year I have been to Morocco, Germany, France, Georgia, Turkey, Ecuador, El Salvador, Cuba, Mongolia, Russia, Taiwan and I am leaving for Croatia right now to compete in a Grand Prix this weekend! I have learned a lot about myself in this last year, and I feel like the most important thing in all sports is to stay consistent! In sports there are many highs and many lows, and you need to learn how to deal with all different sorts of emotions!! It is like a really fun rollercoaster, and you just need to figure out how to brace yourself in moments of uncertainty! I chose this sport because of how it made me feel the moment I stepped foot on the mat. There are no words to describe the feelings you get when you are on the big stage, like the World Championships, representing your country. I’ve always dreamed of this, and now it is all becoming a reality!